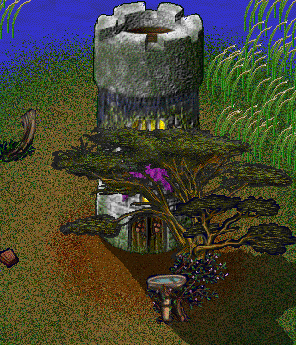 The tower of the mage Zenzel was build on a small island in a lake 3 miles southwest of Arilon. It can only be reached through a basement vault which can be entred through a secret door in the house 1N of the tower or through the well right next to the house. The tower contains lots of levels with ever more dangerous creatures. A fighter with Contego-title shouldn´t have that many problems there, though. In the basement there is a Oneway to the Myrmudryshive and a library with the hidden entrance to the dreamworld. This page was last modified on 13 October 2007, at 14:57.